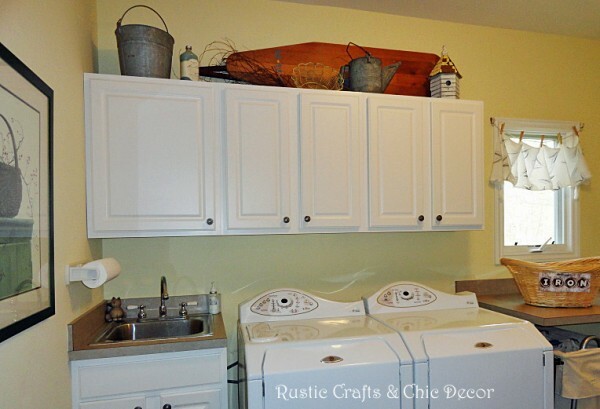 Who says a laundry room has to be plain and ordinary? If you have to get work done, you might as well enjoy the space you are working in! 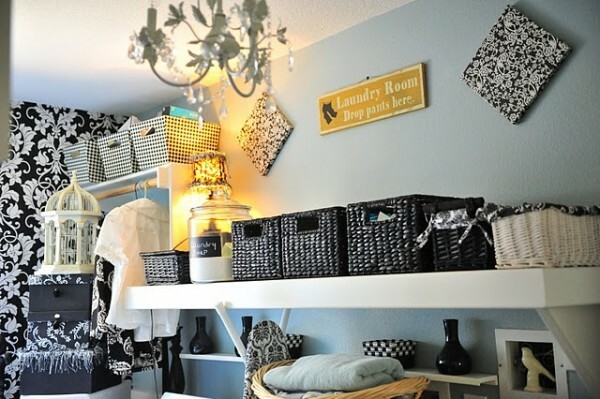 No matter what the size, decorating a laundry room can make it a cheery space rather than a place to go to with dread. Plus, you don’t have to spend an arm and a leg to get it that way! I collect quite a few antiques so in my laundry room, I used the top of my cabinets to display some of my treasures including a vintage wooden ironing board. The window treatment was super simple to make. I just hung an old table runner to some clothesline rope by attaching it with clothespins – kind of a fun theme for a laundry room I thought! I filled the other side of the room with a spare cabinet and old lockers for plenty of storage options. 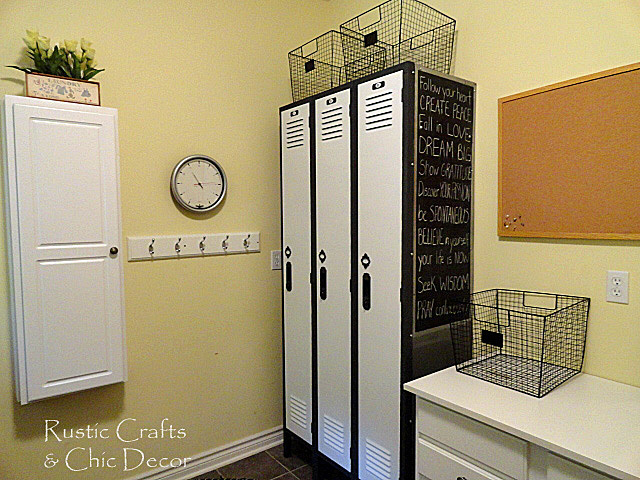 You can see how I did the locker makeover here. A small space behind a sliding door can be decorated super cute too. You wouldn’t have to worry about trying to keep that sliding door shut with this next idea! 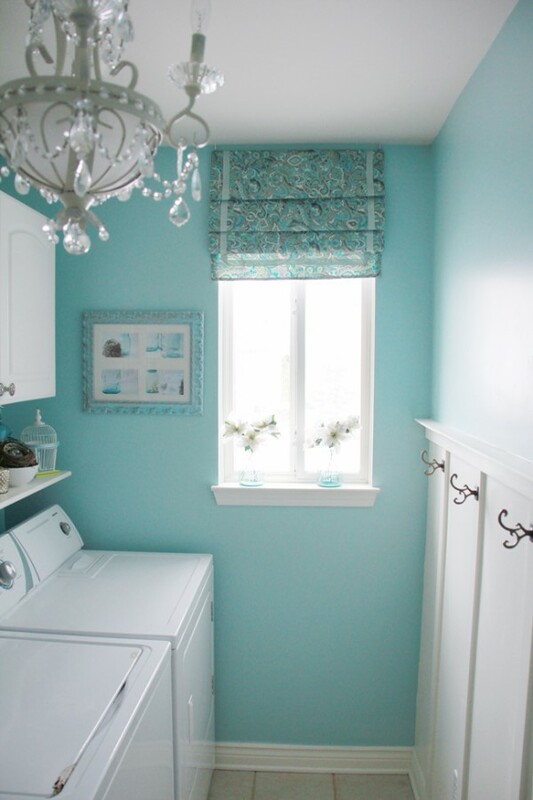 The decor of this pretty laundry room is so opposite of what you would normally feel about a laundry room – I love it! I could definitely hang out in here – bring on the laundry! 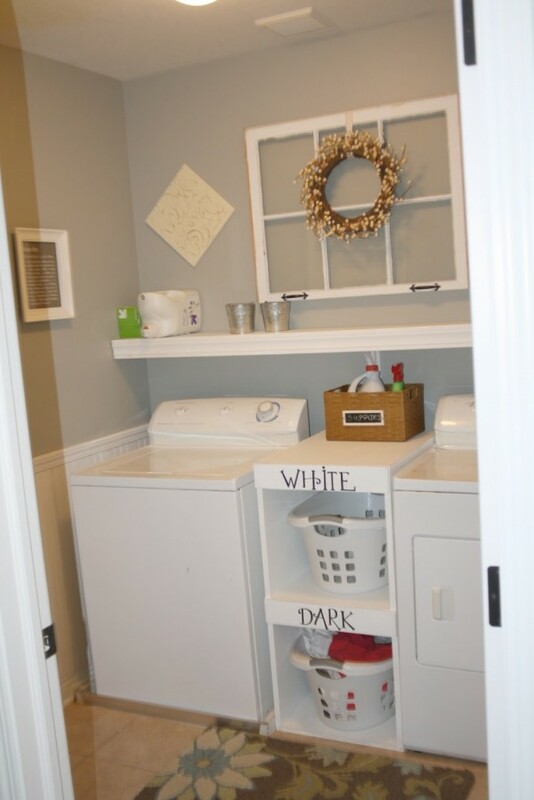 And finally, you are going to want to check out the before and after and in between of this super chic laundry room by Amanda Carol At Home. This is the area above her washer and dryer. Not only is it decorated to the hilt but it is super functional too.